I read this book last year, after a strong recommendation from Bruce Schneier. 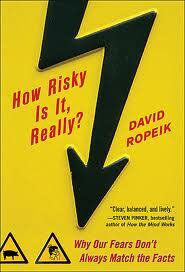 It's a very digestible examination of how humans perceive risk: how we get it right, how our feelings of risk originate, and when they are likely to be inaccurate. Best of all, it isn't preachy or judgemental, it's an impartial examination that has informed my thinking ever since. Here' s a link to some excerpts from the author's website. An additional 3000 people died on US roads after 9/11 because more people drove themselves rather than fly in airplanes. We spend a great deal more on curing cancer than we do on curing heart disease, even though heart disease kills many more people than cancer. The book provides a framework for understanding why we have made these types of choices, but leaves it up to us to decide if our reasons are nonetheless valid. In summary: I recommend it!